The Homestretch (trailer) from spargel productions on Vimeo. "Is this the life I'm going to live for the rest of my life?" Those are the words spoken by one of the three young people at the center of "The Homestretch," a documentary that offers an unprecedented look into the day-to-day lives of three of the estimated 1.6 million homeless youth living in the United States. 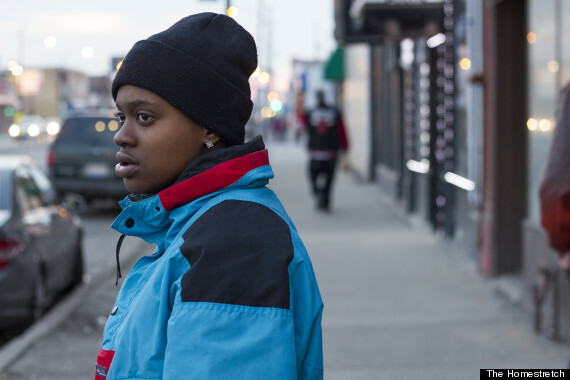 The film, co-produced by Chicago documentary powerhouse Kartemquin Films and New York-based Spargel Production, follows Roque, Kasey and Anthony throughout Chicago over a period of five years, from their teens into their 20s. Kasey became homeless after she came out to her mother as a lesbian. While the subjects all have different stories, they share in one important common theme: the dissolution of their bond with key family members. Their stories are powerful in how they counter the prevailing misconceptions surrounding what leads many young people in the U.S. into homelessness. "What was really apparent is that these young people become homeless because the family somehow broke apart or couldn't fulfill the role it needed to fulfill to take care of these young people," Brooklyn filmmaker Anne de Mare, one of the film's directors, told The Huffington Post. Kasey, for one, was kicked out of her home when she came out to her mother as a lesbian. 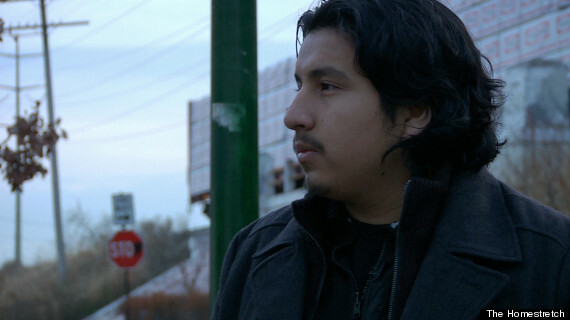 Roque, meanwhile, was left homeless when his family was torn apart due to immigration issues. An estimated 40 percent of homeless youth served by agencies identify as LGBTQ, and a staggering number of U.S. immigrant youth who become separated from their families end up homeless. Anthony, on the other hand, grew up in foster homes and became homeless at the age of 14 when he left an unsafe living situation that was rife with abuse. According to the National Coalition for the Homeless, nearly half of all runaway and homeless U.S. youth are estimated to have experienced physical abuse, and 38 percent of them have been abused emotionally. "You're looking at young people who really need help understanding how to launch as independent people because of the trauma they've experienced to that point where they are on their own and in such danger," de Mare explained. "They need that support, love and care around them to help them grow." Anthony is a savvy and dedicated young man featured in "The Homestretch." The obstacles facing the film's subjects are many, but their struggles typically go unseen in society at large because their stories don't align with the stereotypical narrative many Americans associate with the homeless. In the film, Roque is hopeful that he will be able to attend college but a low high school GPA stemming from his familial instability -- as well as his undocumented status -- threatens to thwart his dream. Kasey's struggles with drugs and alcohol resurface after another bout of family tension. And Anthony hopes he will be reunited with his young son, a dream that still feels distant at the film's end. Jeri Linas is very familiar with the struggles. As the executive director of Chicago's Teen Living Programs, which operates the Belfort House transitional housing facility where both Kasey and Anthony previously stayed for a time, she has seen them firsthand. "When these young people run away from home, they are traumatized before they even get to the street," Linas told HuffPost. "They're fleeing or leaving situations they can't go back to and of course in their minds they're safer away from that, though the reality is that they actually might not be at all safer." Roque was taken in by and essentially joined the family of a former teacher. The bright moments are in the documentary too, of course. Anthony flourishes through his participation in an intensive job training program. Kasey graduates from school after re-enrolling and secures an apartment. And under the watchful eye of a former teacher who has taken him in, Roque seems destined to succeed. It is these moments the filmmakers hope viewers will carry with them as they consider what small steps they can take to become part of a larger safety net for youth in crisis in their own communities. These steps may include lending a hand to local organizations benefiting homeless youth, or pushing lawmakers to support increased funding for programs tackling the issue. "This is the point where if nobody has stepped in until this point, we really as a society need to step in because they're building their entire future," Kirsten Kelly, also a director of the film, told HuffPost. "Something is broken here that we really need to pay attention to because these numbers have hit a crisis level." "The Homestretch" debuted this spring at Hot Docs in Toronto and comes to Chicago, where it was filmed, with a two-week run at Gene Siskel Film Center on Sept. 12. The film will also be screened in Overland Park, Kansas, and Port Jefferson, New York, next month.